We are excited to offer outstanding summer programming for Burnaby Schools students and students from neighbouring districts. With more than 8000 students typically attending, we’ve worked hard to provide amazing learning opportunities for all. Pre-approval: Pre-approval is required for any students currently attending Grade 12 in a Burnaby public school and all non-Burnaby elementary and secondary students. Pre-Approval begins Monday, April 1st. 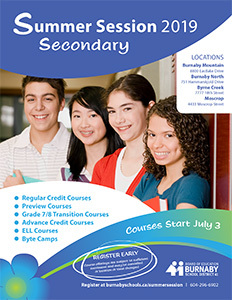 Secondary Registration: Secondary Registration will start on Wednesday, April 17 at 9:00am. Please see Steps 1-4 below for more information. 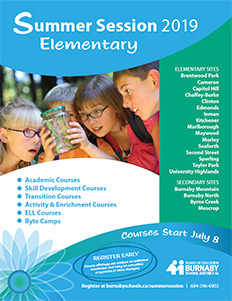 Elementary Registration: Elementary Registration will start on Monday, April 15th at 9:00am. Please see Steps 1-4 below for more information. You will need to know your child’s Personal Education Number (PEN) and upload a number of documents during this process. Once you have your documents scanned (or in an image format), you can proceed with the pre-approval process.